If it’s not a bird or plane you see in the skies lately, it could be a drone! And it’s not just for military use any more. It’s the wave of the future, so be prepared. It’s only a matter of time before these high-flying machines become mainstream. Aspiring aviators and videographers alike, get ready too, because drones are about to rock your world! Unlike remote control airplanes, drones come with better maneuverability and more capabilities. With high-quality picture and precise navigation, it’s thrilling to think of the possibilities for these devices. Formally referred to in the industry as Unmanned Aerial Vehicles (or UAVs), drones are essentially a flying robot1. As the name implies, they are human-operated vehicles that travel by air without anyone on board. Unlike a remote-controlled airplane or helicopter, drones can perform a number of tasks (big or small) and are more intelligent than your average toy. The concept of the UAV is not new. The product dates back to the mid 1800’s when Austrians used them to carry bomb-filled balloons to Venice. They’ve also been tested during During World War I and are currently used for informal military training. The first large-scale production of Unmanned Aerial Vehicles was spearheaded by war stunt pilot turned Hollywood actor, Reginald Denny. His model plane shop on Hollywood Boulevard marketed “Dennymites” to post-war, flying hobbyist during the 1930’s. He later manufactured and sold nearly fifteen thousand drones for the army during World War II. More recently, the CIA has been using unmanned aircraft post 9/11 to help target terrorists in Afghanistan and overseas. Beyond the military, there is increased demand for these devices by both the general public and the private sector for various recreational and business purposes. Drones are quickly becoming more popular for recreational use due to their affordability and availability. As technology to produce UAVs becomes more advanced and in demand, drones have become more affordable to manufacture. As a result, there are a number of competitively priced options on the market today. What used to be a device that took years of training and specialized skills to operate is now easier than ever. Most drones come right out of the box with no assembly required and can be operated with minimal instruction. Drones today are for government, commercial and personal use. From collecting research, to capturing video, to transporting goods, the opportunities are endless. Personal Security – From keeping unwanted intruders out of your home to keeping an eye on your kids playing in the yard. 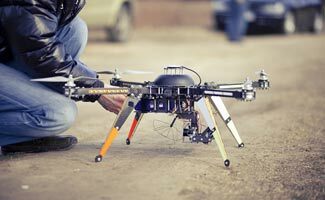 Border Surveillance – The U.S. Customs and Border Protection agency has experimented with using UAV’s to help catch illegal immigrants crossing the United States Mexican border and to assist in cracking down on drug trafficking. Film Production – Creating cinematic scenes and aerial shots makes even an amateur filmmaker look like Steven Spielberg. Saving Lives – Search and rescue crews are using UAVs to find loved ones and deliver medical equipment and supplies to difficult to reach locations. Agriculture – Farmers are using drones equipped with infrared cameras that reveal the health of plants. This allows them to better monitor crop growth and potential issues. Construction – Architects and builders can view progress of projects and get valuable footage, no hard hat required! News – UAVs can fly above traffic and the locations of breaking news, giving reporters live, high-definition footage for their stories. Storm Tracking – Meteorologists can gather temperature, humidity and pressure information to predict tropical storms and document weather trends. Sports – Coaches can watch plays more closely and parents can get a bird’s-eye view of their athletes on the field. Research – Biologists can use drones to gather data including surveying and documenting population changes in wildlife, fauna and more. Fighting Fires – Special ops and rescue crews can use them to assess damage and sense heat. Commercial Delivery – Retail giant Amazon is developing drone technologies to deliver their products on-demand. Other retail ideas include the Burrito Bomber (see below), developed by Darwin Aerospace. It drops parachute-wrapped burritos and claims to be “the world’s first airborne Mexican food delivery service”. The U.S. Federal Aviation Administration (FAA) has yet to set any standards as to how to regulate these aircraft without a flight crew on board. But, according to Wikipedia, the FAA Modernization and Reform Act of 2012 (or the “Drone Act”), requires the agency to create regulations for the commercial use of UAVs by September 20, 20152. The Act currently allows hobbyists to operate UAVs that are under 55 pounds at no more than 400 feet above ground. They must also not interfere with airplane traffic can cannot be operated within five miles of an airport without first contacting airport personnel. The Act also allows Drones to be used by law enforcement for gathering evidence via surveillance, without a warrant, of anything that is visible to the naked human eye. There are concerns about how and where personal drones, camera drones and other drones will be used. UAVs are being criticized for their invasion of privacy and airspace. However, industry supporters argue that the Fourth Amendment (prohibiting unreasonable searches and seizures without a warrant or probable cause) provides ample protection for citizens. Although they are controversial, if regulated and enforced properly, these pilot-less aircraft have huge potential to shape the way the world operates in the future. If you plan on operating a drone, you should consider insurance. Our drone insurance guide has all the resources you need. Where Are Drones for Sale? Our Drones Reviews article allows you to read more about various drones for sale and to find the best fit for you. What do you think of drones? Do you have experience flying drones? Sadie has been exploring the world since she was young - her first international adventure when she was 16 to Japan. She's traveled Europe and throughout the U.S. and loves to experience new places and things. When not writing, she can be found cooking vegetarian food, practicing yoga or enjoying museums and various cultures around DC.